A “week in review” synopsis of Jim Rickards, New York Times bestselling author of The New Case for Gold, The Death of Money, Currency Wars and The Road to Ruin, on Collide. This is a brief synopsis. For Jim’s full coverage of geopolitical events you can subscribe here. Jim is the Editor of Strategic Intelligence, Chief Global Strategist for Meraglim Inc., former general counsel for Long Term Capital Management, and a consultant to the U.S. Intelligence community and U.S. Department of Defense. Please visit Collide for information on subscribing. Overall the market is up about 1.7%. But it’s been up and down all week, and there’s been 300, 400, 500 point moves in a matter of minutes over the course of the week. This is volatility that you should expect to continue. People know what to do with bull markets – you allocate more of your portfolio to stocks, use margin, buys the dips and stay with it while it runs. People also know what to do with bear markets – you rotate out of certain sectors and into defensive sectors like consumer staples. You keep more cash and use less leverage. What people don’t know is what to do right now because it’s neither one and it’s extremely volatile. There are reversals that look like a returning bull market, and then it falls off a cliff. People are nervous and worried. To understand what’s going on here’s a Four Factor Model. The Fed wants growth so they’re using monetary policy. The Trump tax plan is an example. Some people around the President are saying that the U.S. is going to get back to trend growth of 3.5%. Jim thinks the first quarter of 2018 is going to be closer to 2%. When you have a 1.5% debt-to-GDP ratio like the U.S. does, then you’re headed to $1 trillion budget deficits as far as the eye can see. The Keynesian idea is they can stimulate growth by using government spending to replace lagging private spending – maybe getting $1.50 growth for every $1 of debt they create. That only works in limited conditions for short periods of time. It doesn’t work in the long run, and it definitely doesn’t work when you have as much debt as the U.S. has right now. The market thinks the debt is out of control, it’s not sustainable and there’s no way to pay it off without inflation. So the market is going to try to get out of the way of this train wreck. The Fed is making it worse by doing double tightening – raising interest rates and at the same time reducing the amount of money in circulation. That’s part of the current volatility. Trade wars are serious and can stifle global growth. Trump is out to reduce the multi-hundred thousand dollar bi-lateral trade deficit with China. China is making some concessions, but they’ve been making promises since they entered the World Trade Organization and haven’t lived up to them. There’s no reason to believe they’d be more serious about their promises now. Trump knows the game and isn’t a sucker. China may have to buy more goods from the U.S. to do something about the trade deficits. Jim believes the trade wars will get worse, but some people on Wall Street believe things will get better with the talks and concessions. It’s another part of the volatility. North Korea has been dialed down for now, but Iran is now on the front burner. Plus the tragic situation with Syria using chemical weapons has brought a strong reaction against the chemical weapons attack that says biological warfare can’t be normalized. The situation is volatile and there’s a lot we don’t know, but U.S. missiles flying in close proximity to Russian troops isn’t a recipe for stability. There’s good days and bad days but the Middle East region looks like a tinderbox. That adds to the volatility. Mark Zuckerberg of Facebook was testifying on Capital Hill. We haven’t heard the end of this issue. Each of these four things have a big impact on the market and uncertain outcomes. All four could get worse or all four could get better. With four large factors each having two outcomes there’s sixteen ways this could go, and many shades of grey in between. That’s what has investors on edge. One way of dealing with volatility is to increase your cash. There’s not much return on cash, but it reduces the overall volatility in your portfolio. The other way is to have gold. Not a lot. Just 10% of your investable assets as a hedge. None of these issues are going away and none of them are going to be resolved soon. The news each day could be good or bad, and any of the four factors could have big impacts. 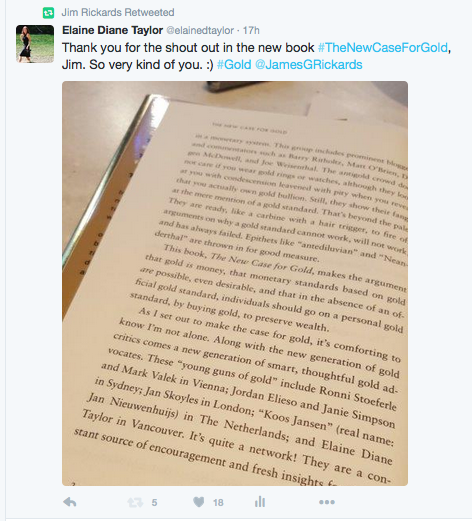 Jim Rickards can be found on Twitter and at James Rickards Project. Nothing on this site is intended as individual investment advice. We’re all watching which way the wind is blowing. Gold is at $1,335.80 U.S. per ounce. Gold is hovering and volatile right now. There’s tension and a limited supply. Physical gold is where people put their excess savings/investment when they don’t trust the government. The world isn’t there quite yet, but with the out-of-control debt and interconnection of nations and markets, it’s a matter of complexity and one small spark setting the blaze. The nations and private hands that want gold are quietly collecting so as not to spook the market and drive the price higher yet, until they have what they want. The price is manipulated, but that only holds for so long when the distrust of government, including central banks, reaches a tipping point. More and more people ask me about gold. More listen when I sing about it. More are affected by the economy and inflation. It’s not yesterday’s world. It’s not your parent’s world or your grandparent’s world. More like your great-great-grandparent’s. So we look further back in history and learn about the changing of the times, and how to best prepare and position for a very good shift and change. And how to help others. My raw gold supplier had 100 ounces of flake and small nuggets from the Canadian B.C. Gold Rush Trail last time we spoke. Ethically sourced and fair paid. A few days ago he was completely out. He’s now making calls to his independent miners to fill an order for me. Hopefully they have some before the snows up there melt and the mining season starts up again. I’m preparing to launch the jewelry side of my world. Art. When the weather’s better I’ll drive up and show you around the Gold Rush area. We’ll go in the water and do some panning. Let me know if you’d like me make a YouTube video to show you how. In Vancouver, spending time in JJ Bean in Yaletown writing. Reading Isaac Asimov’s Foundation series, as it deals with long term cycles in human behaviour. Studying long term cycles in physics, French fashion, the rise and fall of empires and markets. Studying yoga, inspiring vloggers/speakers and bullet journaling. Answered someone’s question, “Why buy gold when it’s not a good investment?” Testing prototypes for jewelry packaging and blind embossing. Very happy with the tactile art process. Working in gold. Designing pieces. Finishing the logo. Writing with the guitar. Playing privately at a club in Vancouver. Yoga. Walking by the water. Granville Island. Picking up more paper samples tonight from the boutique letterpress printer. Beautiful paper. Beautiful city. Single featured in Episode 1 of Mike Maloney’s documentary series Hidden Secrets of Money. Can we afford another go around? It’s a terrible breeze. The news comes down. © 2015 Intelligentsia Media, Inc. All rights reserved. The Greek bank holiday and long lines to get a few euros for the day. Debt deals behind closed doors. The media telling us what opinions to have. China building islands in the South China Sea and claiming all the international waves. More dealing to come. More standing in line for those who owe. Who owes? There’s a long line of nations in debt and this is far from done. Preparing for the Fall live boutique album available on iTunes — featuring Wag the Dog, Black Swan Dive, American Pie and Gods of the Copybook Headings. The copybooks of the early 1900s gave us all the wisdom we need. The sayings that were copied are the truths, the gods, of our world. All the empires who followed the gods of the marketplace instead have fallen, and there’s terror and slaughter when the gods of the copybook headings return. The lyrics are by Rudyard Kipling. One of my gurus. © 2013 Intelligentsia Media Inc. All rights reserved. See the bankers wave their Wall Street wands and conjure piles of paper green. Naked short selling is like betting that your neighbour’s house will burn down. But in this scenario it happens to burn down. If the bankers win then we lose the whole world as we know it. I wrote this in 2009, with a lyric “A little grease (Greece) is floating out to sea, and little pigs (Portugal, Italy, Greece and Spain) are bobbing up and down, they’ll send a storm and we’ll see, when the tide goes out who’s naked on the beach“, and it’s coming on now. The world is changing as we know it.